The life and death true story of Notorious B.I.G. aka Christopher Wallace who rose up from the rough streets of Brooklyn to take the world of hip hop music by storm. 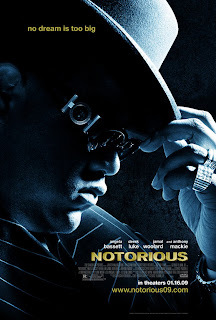 Director George Tillman Jr. (Men of Honor and Soul Food) tackles the true story of Biggie Smalls in "Notorious" and does a capable job of telling his rise to fame and quick death. The film starts with a flashback of the night B.I.G. was shot in Los Angeles than rewinds to his youth growing up on the streets of Brooklyn. The film does it's best job explaining Biggie Smalls rise to fame. Tillman Jr. directed the script written by Reggie Rock Bythewood and Cheo Hodari Coker which spends a large portion on Biggie's rise and less on his death and impact on the Hip Hop world. Jamal Woodward does a fantastic job playing Christopher 'Biggie' Wallace and absolutely becomes the famous prolific rapper. Woodward's performance here in "Notorious" is his first role as an actor, and the rookie does a remarkable job of creating and portraying the image of Biggie. Something must also be said for Christopher Jordan Wallace, the real life son of Biggie Smalls and Faith Evans, portrayal of his father from age 8 to 13. Wallace is perfect in the role and it is nice to see the son play his father at a young age. Derek Luke (Friday Night Lights) plays Puffy Daddy and seems to have toned down the producers flashy personna. Luke does a decent job playing Puffy, however the viewer is never able to become completely engaged in his character in the film. Naturi Naughton also does a good job playing Lil' Kim, but the film portrays that Biggie gave Lil Kim her image, which was not the case. Despite the incorrect character development of Lil' Kim, Naughton is a perfect embodiment of Kim. Antonique Smith is very good as Biggie's wife, Faith Evans. Her scenes shared with Woodward are some the film's most touching moments and the duo ingintes the screen together. Overall "Notorious" is a great film. Director George Tillman Jr. does a great job of tying Biggie's timeline to his musical history. The first battle Biggie does against Primo is amazing and really shows off the potential B.I.G. had. All of the recording sessions filmed throughout "Notorious" are outstanding and do a phenominal job of showing Nototrious B.I.G. creating some of his more famous rap's. The film has a steady pace and spends a decent amount of time on Biggie's various situations through his short life. One area that should have seen more development is Biggie's imapct on the Hip Hop world after his death. The film only loosely covers his impact in a scene where his mother, wonderfully played by Angela Bassett, see's the impact of her son's music. Lastly, "Notorious" is a quality film that deserves a watch and very easily could be a part of any Hip Hop fans movie collection.